My first attempt at explaining all the handicap changes got to two pages before I fell asleep. This time I'm trying to keep it as an overview. On the 23 January we will start using the Slope course rating to determine what adjustment will be made to your Golf Australia (GA) handicap for the course you are playing. The good news is the calculation will be done for you by either using printed score cards or having a table showing the adjustment for the course you are playing. Golflink will go off-line for a few days prior to the 23 January. During this time all scores in your handicap history will be adjusted with a slope rating. When we play Stroke we will also need to have a stableford score for handicapping. All handicaps will be calculated using stableford scores to achieve a more consistent handicap. We are waiting for more information on this but I expect the computer system will do the stableford scoring for us. Remember the old Calculated Course Rating (CCR)? It was a calculation which attempted to determine how difficult the course was playing on the day of competition. DSR is like the old CCR but smarter. It takes into account a lot more variables and produces a better daily rating. This is used by GolfLink as part of the handicap calculation after all the scores have been entered. Are you still with me? There are a few more changes but I have listed the most important ones here. Governor's Legacy Golf Trophy was held during November with Bruce Hancock and Alex Ilkin representing the Hurstville Golf Club. The event was hosted by the Australian Golf Club. Legacy is dedicated to the welfare of the spouses and dependent children of defence force personnel killed in war or training. Golf Australia has entered into a partnership to support Legacy and Hurstville Golf Club is looking to also help this worthy charity. Congratulations to Bruce who won the 3rd Grade competition. Nice to see those secret lessons have paid dividends for Bruce. Rules 23 and 24 deal with Loose Impediments and Obstructions, and it’s helpful to know the difference. A loose impediment is a natural object; e.g. stones, leaves, branches, bugs, dead birds and banana skins. Carlos Franco (pictured left) is a natural object and, as such, is a loose impediment. He may be dragged away without penalty since he is not in a hazard. Movable Obstructions are artificial and can be moved without unreasonable effort. E.g. rakes, rubbish, unfixed signage, ropes, other player’s golf clubs and stakes (except out of bounds). 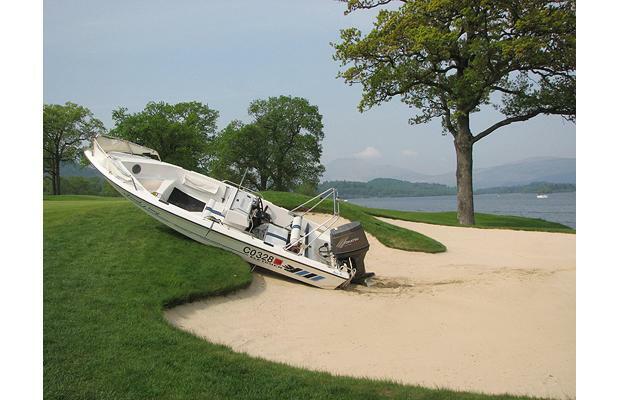 I'm not sure if it would require unreasonable effort to remove the speed boat that some goose landed in a bunker at Loch Lomond Golf Course. Henrik Swenson elected not to take relief from the bridge (pictured left). He then put the ball on the centre of the green and saved par. Now that you know the difference, visit the R&A Web Site to see what relief you get. The qualifying rounds of the 2013 Encourage Shield have been completed and our Open Junior team once again showing that they are a force to be reckoned with. Our Juniors finished with 2 Wins, 2 Halves, 1 Loss. This gave them 17.50 points and they finished in second place to the Concord team on 21 points. The Concord team, who progressed to the finals, won all their games except one: They were beaten by the mighty Hurstville team 4-1. Alex and Bruce (in frightening yellow) have time for quick can-can while playing at the Legacy Golf Day. Hurstville Golf Club had made a donations to Oatley Public School for a fundraising event on Wednesday 27th November. Proceeds from the event will go to local charity called 'Foster Care Angels'. Congratulations to Nelly Falloon and Narelle Hellyer who finished in a tie for 7th place in the Zone B Play Off in the NSW Golf Women’s Fourball Classic. Forty teams competed in the Metropolitan Play Off held at Bankstown Golf Course. The top four teams moved to the next round at Bonville so our ladies just missed out. Bummer, but still an awesome effort! Add your name to the registration sheets in the pro shop. Would you like Sweet and Sour Sauce with that? Which former committee member recently used his undrawn raffle ticket to wipe up fried rice and sweet and sour sauce from the table while dining at Grandviews Bowling Club? And then discarded the soggy ticket. And whose ticket was drawn out minutes later? A hasty exit past the kitchen to the bins to retrieve said ticket within the 3 minutes he had to claim the prize. Luck remained with our member who located the very messy ticket which he presented to the Raffle organizers, fried rice and all. Was it worth it? Yes – the prize was $250 cash. Please let me know if you have anything you would like included in the newsletter (vicki.hoare@gmail.com). Both events will be a shotgun start with lots of prizes including Christmas hams. The event will be Bisque Par. I'll send out a seperate email telling you how this works but you can also look it up by looking here. I HATE Par, but this format makes it fun. The golf course is looking to install traffic lights on the path behind the first tee after a head-on collision between two carts yesterday. We are saddened to report the collision resulted in the untimely death on a front tyre. Attempts were made a the scene of the crash to revive the tyre but it could not be saved. Want some great publicity for your business? For the tiny, tiny price of $85.00 (+ GST) you can have an ad in the 2014 Fixtures Book. You will also be listed as a sponsor on our web page and have a link to your web page.